The first Brewery & Distillery Fusion in the state of Minnesota – their mission is to bring great beverages to the public. The idea is to make tasty brews and powerful booze with clever flavors while having fun and making the experience entertaining for everyone involved. Defiantly Different. The brewery is 7500 square feet of warehouse space in Roseville, Minnesota, conveniently located near Grumpy’s Roseville at Snelling Ave. and County Road C. The brewhouse uses a 2-vessel, 20-barrel system that fills four 40-barrel conical fermenters, as well as a 5-barrel pilot system that fills a 5-barrel conical fermenter used primarily for sour beers. 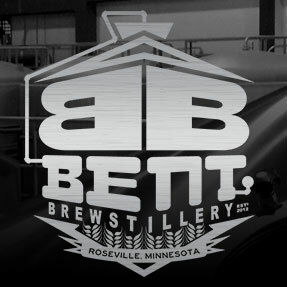 Bent Brewstillery produces two year-round beers – Nordic Blonde (Amber Blonde Ale), and Moar (Historical India Pale Ale), and four seasonal beers Über Lüpin (Spring), Lakeside Blonde (Summer), El Guerrero (Fall), and Maroon and Bold (Winter). Bent Brewstillery also produces some well renowned specialty beers in their Funked Up series and ExperimentALES series.